The Maple Tree Place concert series returns with 10 shows starting June 21. Fans of summer gatherings, live music and classic tunes can rejoice with the return of the Maple Tree Place Summer Concert Series next week. After a one-year hiatus and with the shopping center under new management, the concert series returns for a 10-week run of free Thursday night shows. Concerts start at 6:30 p.m. at Maple Tree Place’s central green. Each of the shows is a tribute to legendary bands and musicians, including the kickoff Prince tribute next Thursday. Other acts include “Kiss the Sky” Jimi Hendrix tribute, “Britishmania” Beatles tribute, “Another Tequila Sunrise” Eagles tribute and “I’ll be Frank” Frank Sinatra tribute. 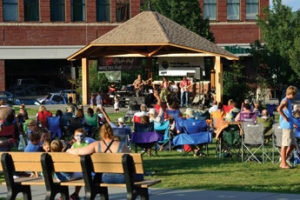 Thursday night concerts had been a staple of summer at the shopping center since 2007 but were scuttled last year as the property underwent an ownership change. Maple Tree Place was sold to Cypress Equities, a Dallas-based company, in August of 2016. Cypress then sold its stake in the property in December of 2017, according to Cypress Equities spokesman Glen Miller. The property is now owned and managed by Brookfield Properties Retail Group, a New York-based company that also owns a majority stake in the Burlington Town Center mall. For this summer’s concert series, property managers sought out bands that perform nationally but have an understanding of Williston’s character, Sidney-Plummer said.